RB-DSD8 8 Channel Silence Switcher. The RB-DSD8 8 channel silence switcher works in a similar way to the Sonifex RB-SD1 and RB-DSD1 but allows for 4 stereo channels of audio. These stereo audio channels can be either analogue or digital and can be used independently to give 4 stereo silence detectors or they can be linked to handle multichannel audio inputs, e.g. for 5.1 and 7.1 surround systems. Designed to switch from one input (or set of inputs) to another in the event of loss of audio, the unit is ideal at transmitter sites, or after the master output of a studio, to switch in another audio source, or simultaneous broadcast, should a master source fail. On loss of level of the main input. On loss of level on one channel of the main input. On loss of synchronisation lock of a main digital input. The 2 x 8 channel audio inputs can accept both digital and analogue connections, with the unit automatically recognising a digital input. For the 8 channel outputs, by setting the appropriate DIPSwitches, each stereo output can be designated as either an analogue pair or as a digital output, thus making the RB-DSD8 incredibly flexible and suitable for many different applications. The unit level settings are in dBFS but when using analogue signals the equivalent full scale value can be set to +24dBu, +18dBu, or +12dBu by DIPSwitches. Each stereo pair has individual settings and controls and when stereo signals are linked, the foremost pair determines the switching characteristics and controls to be used. Each stereo pair has an AES LED that shows the status of the digital audio on that channel and a Selection LED to show that input is currently being sent to each respective output. Two Presence LEDS for the left and right inputs of each stereo pair indicate the input level of the channels. The unit can switch between sources manually or automatically at the push of a button. If switching manually, silence detection is disabled and the user chooses when to switch using the main or backup buttons. If switching automatically, the unit switches between the two sources automatically upon the detection of silence. Each pair can be set to switch manually or automatically and the current setting is indicated by the Mode LED. Link/Select buttons are used to group channels together to access multichannel operation and switch simultaneously. Each pair has a Link/Select button which illuminates blue when active. Pressing and holding the first Link/Select button with any other Link/Select button causes all inputs up to that point to be selected. The RB-DSD8 has a ‘slave mode’ that allows you to connect two RB-DSD8 units and control them simultaneously from one unit. The silence detect level is adjustable between -39dBFS and -84dBFS in 3dBFS steps via DIPSwitches and this level is compared to peak signals. 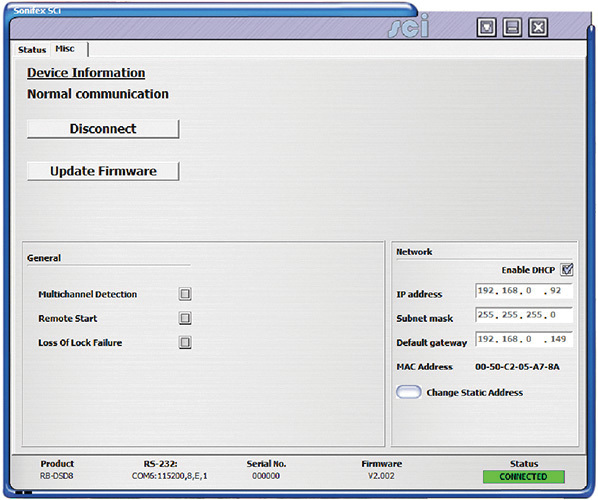 The silence interval can be adjusted between 2 seconds and 254 seconds in 2 second steps via DIPSwitches. 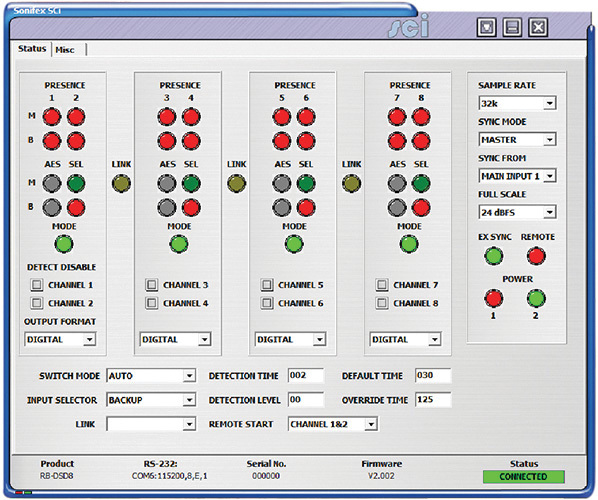 A powerful feature of the RB-DSD8 is that by using the Sonifex SCi serial software, the unit can be programmed for different delay durations, levels and switching functions so that you can set up the unit for your specific application. A DIPSwitch configures the unit to be controlled serially which is indicated by a front panel LED. You can control the unit remotely using either USB or Ethernet. The RB-DSD8 has been designed with dual redundant power supplies. This means that if either power supply fails, the other is ready to take over. In the extremely unlikely event that both fail, the unit has been designed with a passive signal path through the main input. This is essential for applications such as installation at transmitter sites, where a power failure to the unit should not prevent the audio input signal from being output to the transmitter. Contact Sonifex for further information if you have a particular requirement that isn’t catered for by the RB-DSD8 as standard. All digital input signals are routed to a sample rate converter allowing mixed incoming sample rates to be used. The output sample rates are selectable from a predefined master clock of 32kHz, 44.1kHz, 48kHz, 88.2kHz, 96kHz, 176.4kHz or 192kHz or the clock can be derived from a sync input. When analogue inputs are selected, the analogue to digital converters are also clocked at that sample rate. In this mode no output is generated until lock is achieved with a sync signal. The digital output sample rate now follows the sync input. If the sync signal is removed then the output sample rate is set by, and locked to, the internal on-board clock generator at the closest frequency available to the previous sync input. Here the digital output sample rate follows the sync input. When the sync signal is not present the digital output is turned off.